Venezuelans continue to fight for survival, as the nation’s socialist experiment has all but collapsed. Looting is commonplace. Hunger is rampant, with Venezuelans of every economic class eating out of garbage cans for sustenance. And a medical system that is so starved of supplies, like soap and gloves, that newborns are reportedly being put in cardboard boxes in maternity wards. That’s coupled with the spikes in infant deaths that began when the country started to falter. The energy shortages haven’t helped either. The rapid inflation has rendered the nation’s currency worthless, there’s no real domestic food production, and all of this has led to empty shelves at supermarkets. The hunt for food started at 4 a.m., when Alexis Camascaro woke up to get in line outside the supermarket. By the time he arrived, there were already 100 people ahead of him. Camascaro never made it inside. Truckloads of Venezuelan troops arrived in the darkness, arresting him and nearly 30 others seemingly pulled from the queue at random, according to his lawyer. Camascaro, 50, was charged with violating laws against interfering “directly or indirectly” with the production, transportation or sale of food. He has been in jail for three months awaiting a hearing. I went to see the prosecutors and explained that he was just buying some food for his family. He’s not a bachaquero,” said Lucía Mata, Camascaro’s attorney, using the Venezuelan term for someone who buys scarce, price-capped or government-subsidized goods to resell on the black market. 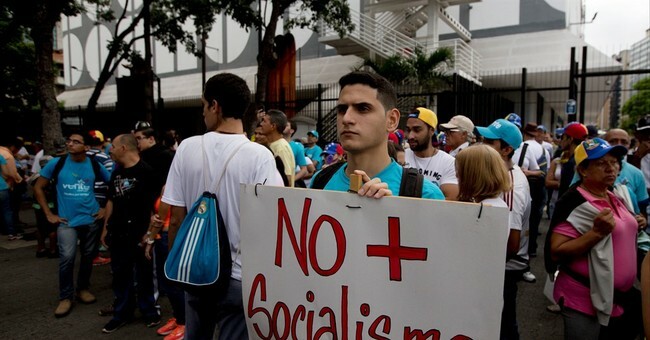 …[T]he Venezuelan government has arrested or detained at least 9,400 people this year for allegedly breaking laws against hoarding, reselling goods or attempting to stand in line outside normal store hours, according to the Venezuelan human rights organization Movimiento Vinotinto. Many were taken into custody by the Venezuelan troops assigned to police the checkout aisles and the long lines snaking into supermarkets. Ismary Quiros, a deputy director at Movimiento Vinotinto, said the law does not define exactly what constitutes illegal hoarding, smuggling, or reselling of goods. She said the government’s real goal is to find scapegoats for the scarcities. According to the Caracas-based rights group Provea, national guard troops have periodically carried out a mass-arrest operation nicknamed “Dracula’s Bus” to round up Venezuelans trying to wait in line overnight for groceries, now a banned practice. Oh, and of course, due process is a not even considered in these proceedings. The Post added that many that are arrested are simply trying to keep their families alive, with economists estimating that almost half of the Venezuelan workforce is dependent on black market goods to make it through the day. When you have to mandate that people leave their jobs to work in the fields, you know your economic experiment has failed. When the nation’s military is part of a new policing unit to monitor food distribution, you know 21st Century Socialism is a total disaster.